One part bread. One part vegetable. One part cheese. One awesome panini that rhymes. 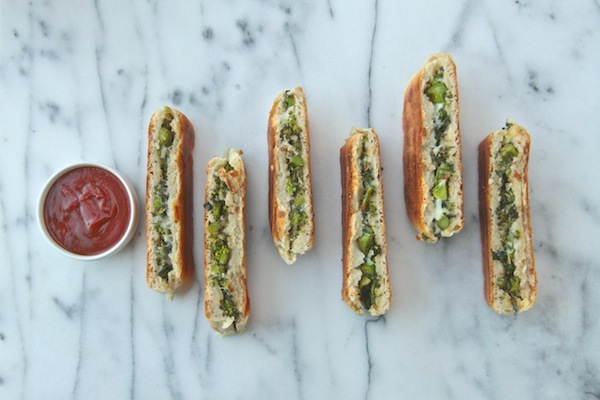 One sandwich that tastes like a vegetable laden/crispy pizza when dipped into marinara sauce. 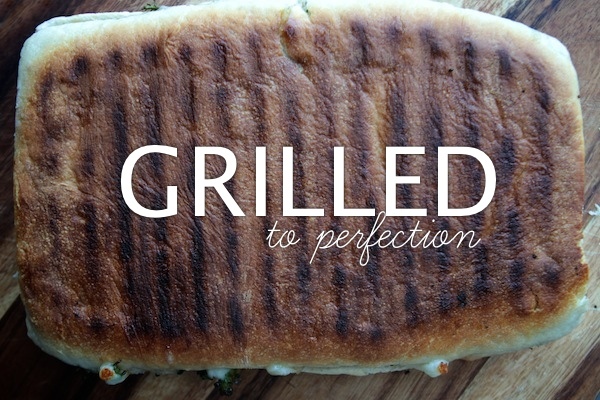 One more reason I’m obsessed with my panini press. Seriously. Is there anything it can’t do?!! Oh. 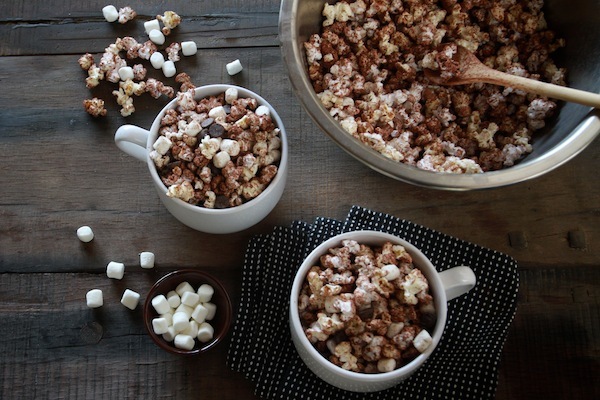 It doesn’t make popcorn. Dang. And we’re off! Super simple ingredients. Super big reward. That should be my motto. Super into it. Onion chopped. Garlic chopped. Broccolini (which means baby broccoli in Italian) CHOPPED. Onions go in first. Cook til translucent. Add in the rest…and then garlic last. Garlic can burn if you’re not careful. A squeeze of lemon to brighten up the flavor. Focaccia opened up! Cooper told me it looked like a book. He’s not wrong. I’m thankful he didn’t say it looked like an iPad. Cheese on top. I used Bocconcini (which rhymes with Broccolini and Panini!) and tore them up into shreds. Drizzle oil on both sides of your focaccia. 10-15 mins later. THIS BEAUTY. Get yourself something to dip it in. Can you see that cute little string of melted cheese in there? YES. 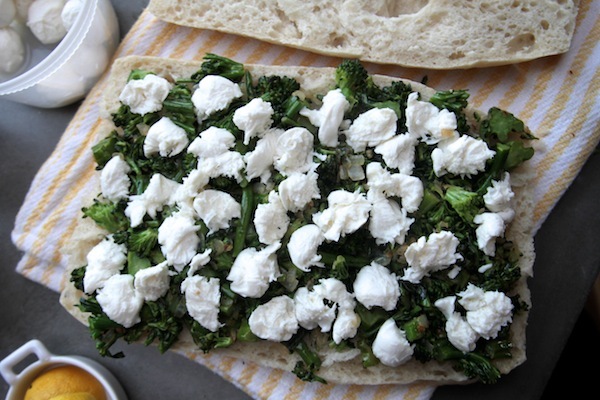 Broccolini Panini with Bocconcini. Pure/delicious poetry. 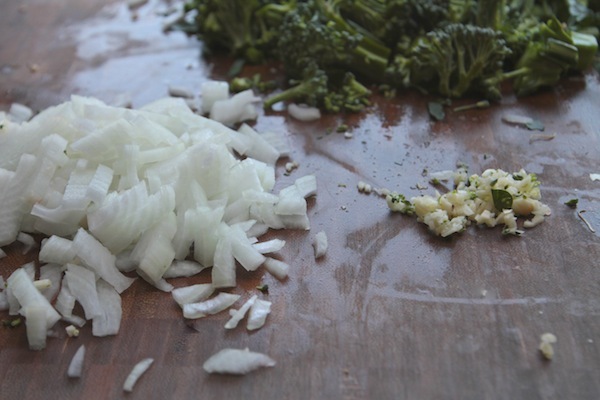 Remove broccolini’s heavy stems, and chop into 1/2 inch pieces. 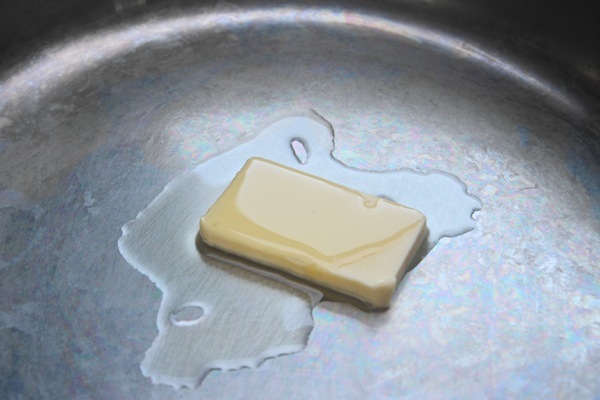 Heat the butter and 1 tablespoon olive oil in a large sauté pan over medium heat. Add the onion and pinch of salt & pepper, and cook until onion is translucent, about 4-5 minutes. 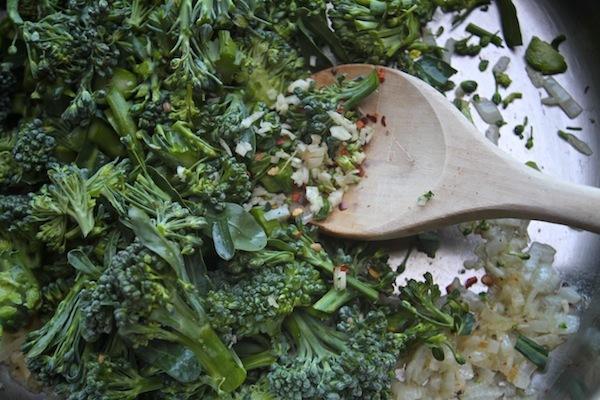 Increase the heat to medium-high and add the chopped broccolini and cook until leaves become tender, about 4 minutes. Add the garlic and red pepper and continue to cook for another 2-3 minutes. 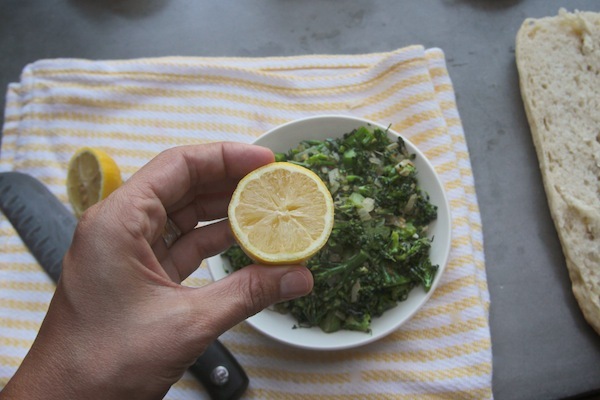 Take broccolini off the heat and squeeze fresh lemon juice on top and stir to combine. Heat a well seasoned grill pan or panini press over medium high heat. 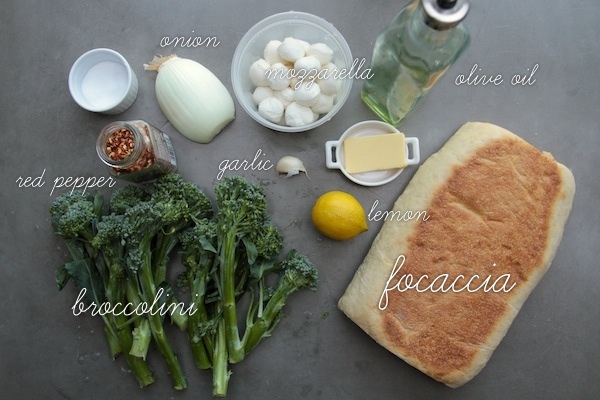 Cut focaccia in half and evenly spread broccolini on one side. Top with torn bocconcini and finish with salt & pepper. Sandwich the other piece of focaccia on top and brush each side of focaccia with olive oil. Place sandwich on the panini press and cook for 10-15 minutes or until cheese is throughly melted. Cut into small rectangular sandwiches and serve with a side of marinara for dipping while sandwiches are still hot. Not usually a fan of Brocollini, but who can resist a rhyming meal?! Ooh yum! 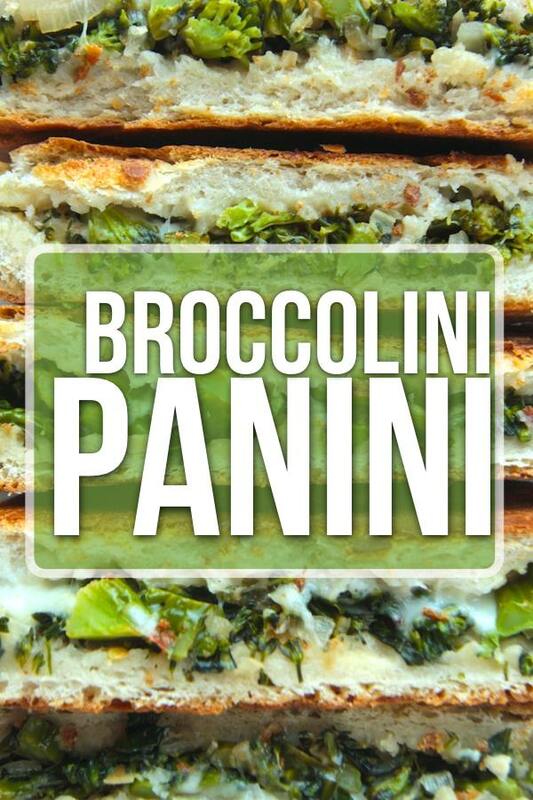 I love the Brocollini Panini, such a cute name! Woah! 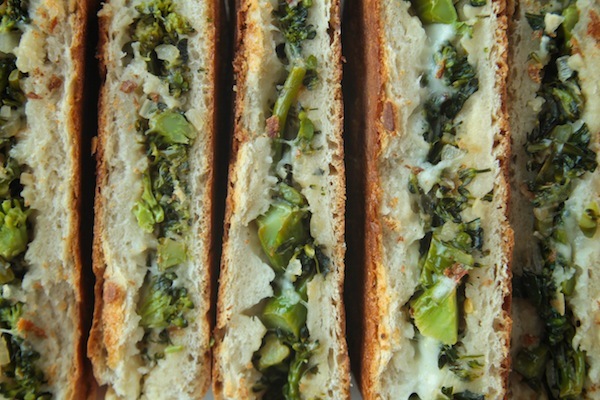 Broccolini Panini is the best name ever – for anything actually. 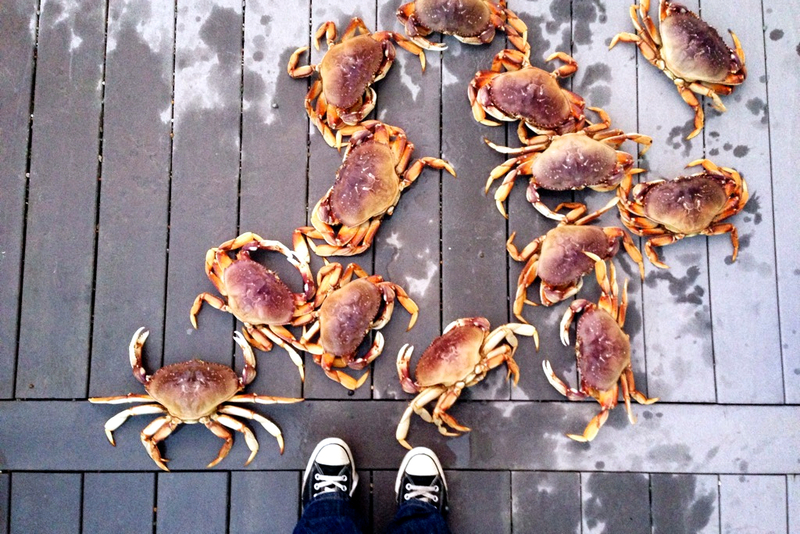 Sigh – this looks so awesome! 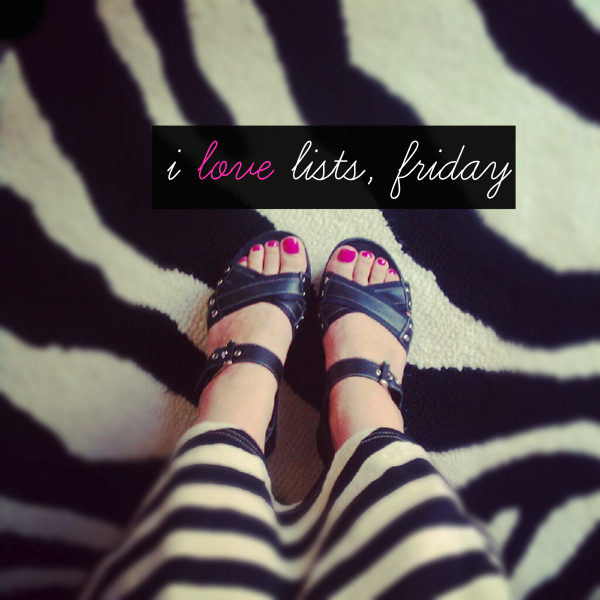 I’m all over this! What a fabulous recipe!! Oh wow does this look good! Hmmm, can I justify a panini press?? YUM! This looks incredible and I love the combo of broccoli and cheese. It is always a winner! My fingers have a mind of their own sometimes! Oops. I think this may be my favorite panini ever. Wow. I think you have blown my mind with this recipe! Daaaaang!!! cheese and vegetables with a bread – who can resist that really? Around these parts in Canada, broccolini goes by the name ‘rapini.’ So when I made this the other day from The Smitten Kitchen cookbook, I renamed it,’Rapini Panini’ and it is deliciously yummy. Only next time, I am going to try it with your addition of the marinara sauce and kick it a notch with some heat. you are really swaying me heavily toward a panini press, tracy! WOW absolutely mouthwatering. 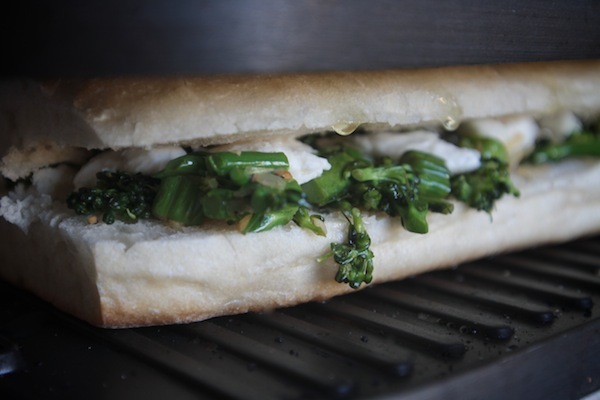 I never would have thought of putting broccolini in a sandwich but wow does it ever look delicious! This looks AWESOME!!! It reminds me of a yummy sub at No. 7 Sub in manhattan. If you’re ever in nyc you need to go- their menu is so unique and yummy. Whoa, this looks good! Your photos are so enticing! We like panini’s. Gotta try this one! This is such a unique twist on a panini! 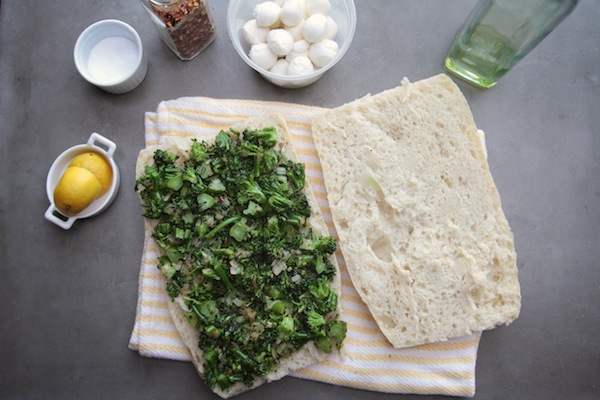 I love my panini maker and always make roasted veggie paninis – but never with broccolini! Almost like a calzone, right? Will definitely try this! All you need is ricotta and you’d totally have a calzone panini! I got so excited for this recipe I am making it tonight for dinner. My only question is 11 lb on broccolini? Is that a type? I love how I typo-ed “typo”. Yikes. Just finished making the panini. So delicious! And saving the extra filling for leftovers for the week. we’re totally human! I’m so glad you tried it! You didn’t make 11 lbs. did you?!!! No, I did not. Although I was a bit tired when I went to the store so I might have stared at the broccolini contemplating exactly how much 11 lbs would be. Then I realize it must have been a mistake, or I was going to be making a lot of sandwiches in my future. You’re the Dr. Seuss of sandwiches! Maybe you should write a children’s book. I’ve never had broccoli in my sandwiches. I can imagine how good it is… with that stringy stringy cheese. This looks delicious. I’ve been loving your pictures of paninis lately. What is your take on the panini press? I read that its not really good for cooking meat because the fat doesn’t drain off and that there’s some plastic pieces that break off easily. I’ve used it a few times to cook meat- I’d much rather use a grill or a pan for that. It will steam the meat more than sear it. I haven’t had any issues with plastic breaking off one mine (crossing fingers) BUT I must say that I use it almost every day. It’s how I make toast! I was sold on just the name! This looks interesting. One I have to try I think. Well done with the pictures, they look amazing. Must take a while. I’m inspired now! Great post. That looks absolutely delicious. And now, I’m hungry. I want to shout this recipe title from the rooftops in a horrible Italian accent! 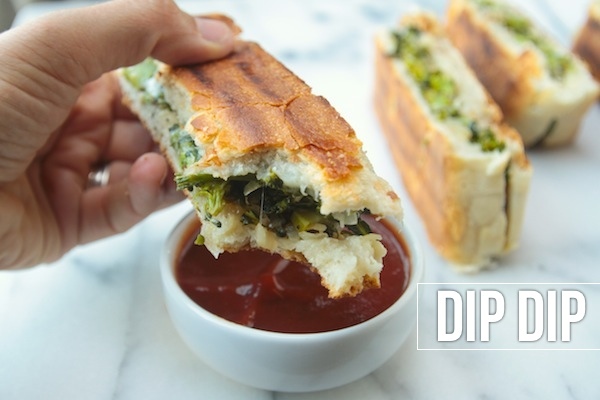 BROCCOLINI PANINI! It is so hard to express accents via blog comments. 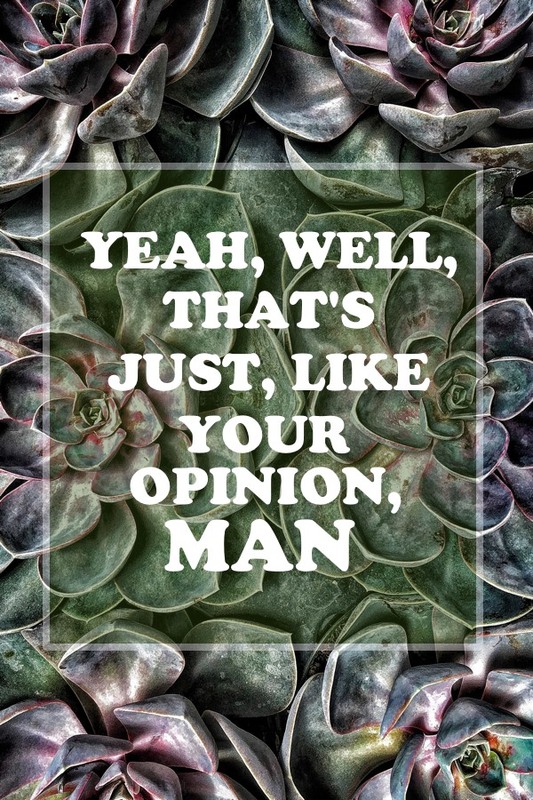 Your font on the first image totally reads in Oprah voice. 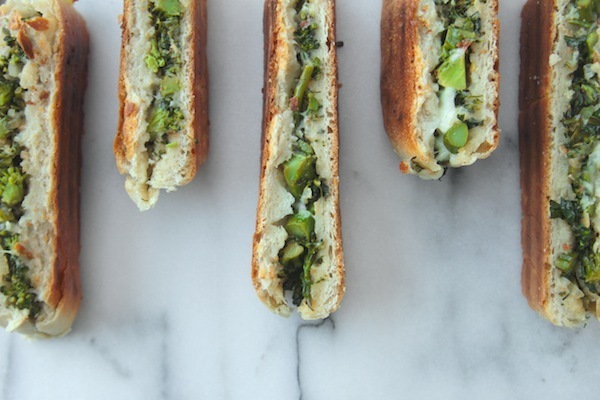 And YOU get a broccolini panini… and YOU get a broccolini panini!! Amazing. Looks delish per usual. This is great. 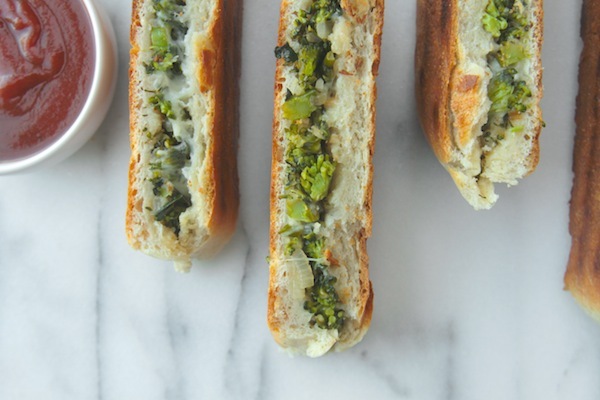 I would never have thought of adding broccolini in a Panini in a million years. What a great name. Thanks. I just got a panini press today! I’m so excited to try it out. 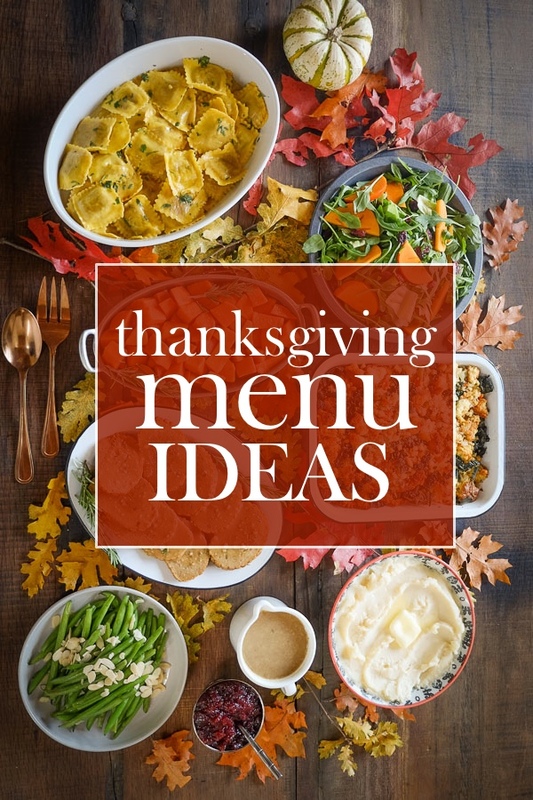 This recipe looks perfect! Kind of like a grilled calzone. Yum, yum! 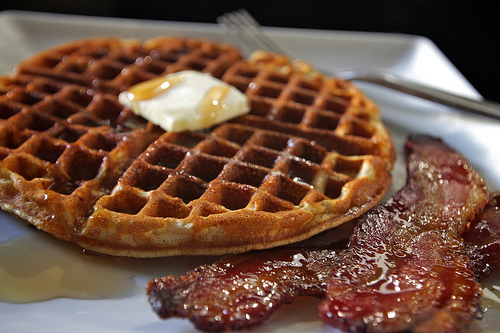 I want this as an after-school snack! FYI…the garlic isn’t in the ingredient list. thanks for catching that. Updating now.